Jillian serves as the Campus Recruiting Lead on our recruiting team, overseeing our target schools to recruit for our client service team. She graduated from Cornell University and started at AlphaSights in 2017. 7:30 AM: My alarm clock rings and I’m up and getting ready. I live in midtown Manhattan in the Herald Square area, conveniently just a 15-minute walk to work. I make sure to grab my suitcase before running out of my apartment, as I’ll be heading to a campus following the work day. 8:30 AM: When I first get to work and say hi to my team, I head into our kitchen to grab coffee and some breakfast to begin the day. It’s great to catch up with co-workers in the kitchen about their plans the night prior before settling in. From there, I head to the desk and respond to any candidate or career center emails that I received since the last time I was in office and begin making my to-do list for the day. Every day is very different from the next during campus season, so it’s important to prioritize and plan out what needs to get done! 9:15 AM My first interview of the day! When I’m not traveling, one of my focuses is evaluation for the client service team, which means conducting a 45-minute, first-round interview via video chat. It’s great to learn about seniors in college and early career professionals, and determine if their career goals align with what we can offer them here at AlphaSights. Today I had a great conversation with this candidate; she was a confident communicator, demonstrated high drive through her on-campus activities, and clearly articulated why a client facing role made sense for her; I will definitely be passing her through to the next round! 10:00 AM: I’m headed over to one of our conference rooms to lead a training for our info session the following week. Members of the campus recruiting team each manage a group of universities, from event planning, to marketing initiatives, to strategy, and of course, heading to events. I’ll be traveling to Duke with two of our client service associates and one of our VPs, so I meet with them to give them trip logistics and practice our presentation for the info session. At the end of the meeting, we’ve already begun making dinner plans for when we’re in Durham — trying out the best cuisines nearby campuses around the country is admittedly one of my guilty pleasures when travel season comes around! 10:45 AM: I head back over to the desk and begin sending out final marketing materials and reminders to candidates for our Duke info session the following week. We currently have 25% more RSVPs than the previous year, which is a nice increase to see. We’re expecting a full house! 11:15 AM: Our application drop recently closed for another one of our target schools, University of Michigan, so I begin to go through all of the resumes we received and organize which candidates I think the team should interview when we head to campus. After hosting events on campus, it’s rewarding to see that we received hundreds of applications for the role. Screening candidates for interviews is an incredibly important part of the process, so I’m very diligent when I do my reviews. It’s exciting to see that so many of the strong candidates we met on campus decided to apply! 12:30 PM: I take a break from reviewing resumes, because it’s lunch time! The office offers subsidized lunch catering right in office. I head to the kitchen to wait in line and am excited to see that my favorite Italian place is serving pasta today. I grab a table in the kitchen with a few of my colleagues to unwind and catch up. Our team is currently planning out our next monthly team event (karaoke!) so we begin brainstorming and laughing about which songs we’ll be singing. 1:30 PM: I head into our lounge area to take a call with one of our career center contacts at our newest target school. While it feels like fall recruiting season is still in full swing, believe it or not, we need to begin planning the winter season as well! I start determining which strategies to implement for when we head back on campus and share successes that we’ve had so far with our contact. I take a lot of notes during this call, and get some great ideas for what our strategy should be to increase brand awareness amongst students that I’m excited to share with the team. 2:00PM: I head into a one on one catch up with a new campus recruiter that I’ve been training for the past few months. I always begin our meetings by asking her the highs and lows of the past week to gauge how she’s doing with her first season on the road. We begin prioritizing her to-dos for the following week, and I check in on how her assigned target schools are performing this season. Since we’re so busy on the road in September and October, it’s nice to have this chance to check in and ensure that she’s developing in her role properly and feeling supported. 2:45 PM: I head over to my desk and begin digging into our campus data to track our progress at each of our target schools. I was never a ‘numbers’ person before this role, but I’ve learned a ton from the managers on our team about how to look at metrics, progression rates, and more. Now, this analysis is one of my favorite parts of the day. I love getting to see the numbers behind our successes and determining areas for improvement. 3:15 PM: I’m headed into my last two interviews of the day, one for our internship program, and one for our full-time program. 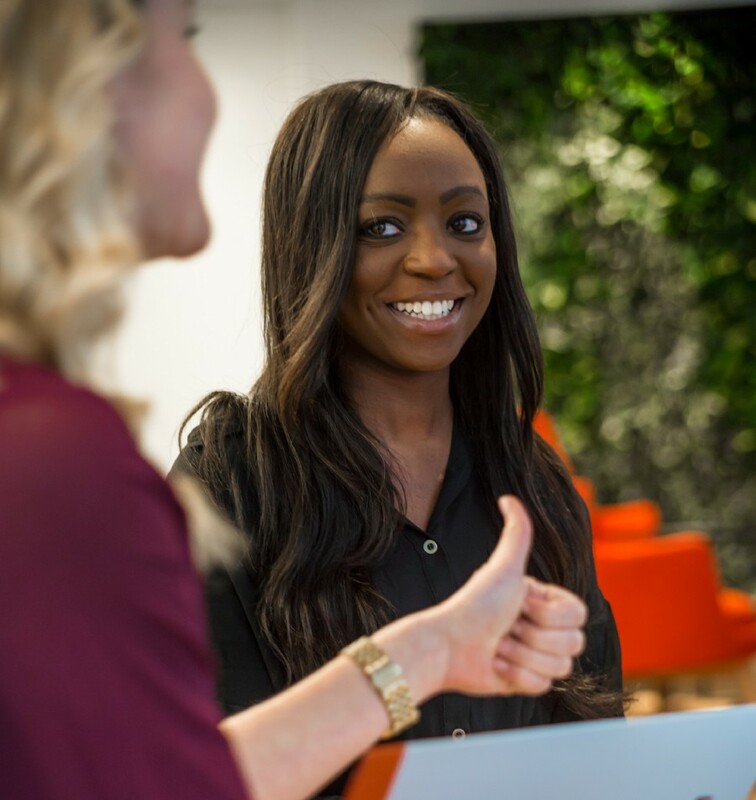 One of my favorite parts of recruiting for our client service team is that there is no ‘cookie cutter’ resume or specific type of candidate that ends up applying or getting hired. I’ll chat with one student athlete studying Government in school, followed by a business major who started his own company on campus; it’s such a great range! 4:30 PM: My interviews wrap up, and I’m headed to one of my favorite meetings of the day — candidate debrief. This is when we meet with the client service managers and VPs who have interviewed candidates that my team has progressed. It’s great to hear how the interviews went and think of new questions to ask in interviews based on feedback. Even better, this debrief is a successful one, and 3 of the candidates we met will receive offers. It’s offer Tuesday! 5:00 PM: Our full recruiting team (a little over ten of us) gather for our weekly recruiting touchbase. This is when we share updates on what we’ve been working on, brainstorm new team strategies/initiatives, and talk through any challenges we’re facing. Touch-bases are super productive and it’s always fun to catch up with the team. Interested in a career in recruiting? 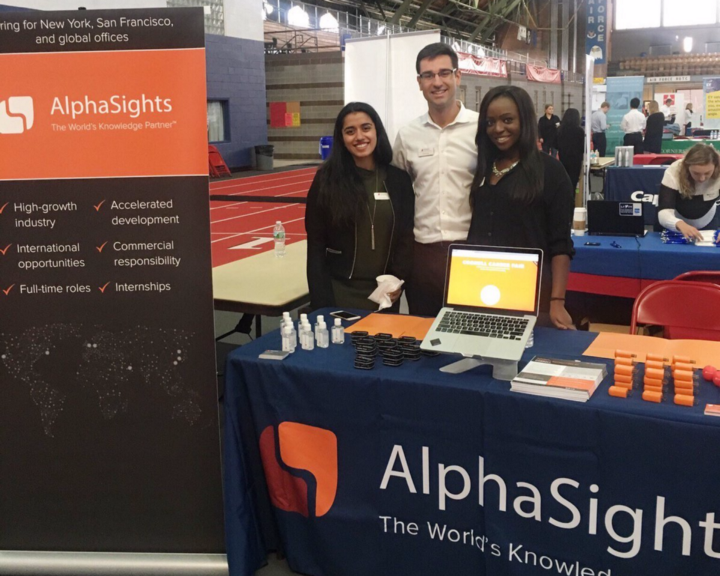 AlphaSights hires entry-level Recruiting Coordinators to join our team each year! Look out for opportunities on alphasights.com/careers or reach out to a member of the recruiting team to learn more.